This week a 2-year old boy came to the Tot-Mama Yoga class distraught. He and his mother arrived by bicycle—as they do every week—and he had wanted to wear his sunglasses, but his mom had not been able to find them. In full-on meltdown mode he was sobbing and fending anyone off who had the audacity to try to comfort him. He WANTED his sunglasses. Having them was the only thing—he had convinced himself—that would get him out of that funk. I think I know how he felt. And, I’m pretty sure, it wasn’t about the sunglasses. The only difference between a toddler’s tantrum and one of my inner child’s terrible, horrible, no good, very bad days, is that I don’t get to let it all out like that. Sometimes it seems like it would help to let it rip, but for this little boy it just seemed to add to his misery the more he fussed. His mom was able to get him upstairs to the yoga studio and held him in her lap, as the group of mothers and toddlers made their bellies big and small, breathing in and out as I expanded and condensed the Hoberman Sphere. Within two cycles of mindful breathing, the sobbing stopped. “Would you like to have the first turn with the breathing sphere?” I asked him. The sniffling toddler took hold of two hinges on the sphere, settled into his body as he found a soothing rhythm of “big” and “small,” “breathing in” and “breathing out.” During the rest of the class, he smiled, laughed, tumbled, balanced and walked mindfully along with the other children and their moms. His mother and I traded a satisfied look. 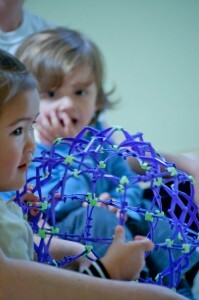 Because we had practiced many times, the ritual of breathing while watching the folding and unfolding of the Hoberman Sphere had become a touchstone that soothed the child quickly. It was hard for him to stay upset, once he was focused and calm. He had a touchstone of peace—a tool for self-regulation. We all could benefit from having practices in our back pocket that we can pull out anytime we’re feeling sad, stressed or overwhelmed. I don’t know what I would do without mine. Probably kick and scream on the floor (which would be a little embarrassing at my age). • Chanting, singing or toning. • Doing yoga postures, movement or dancing. • Silently repeating an affirmation, mantra or prayer. • Walking in nature and feeling the earth beneath my feet. • Calling in an animal spirit or even just thinking of a beloved pet. What are your soothing touchstones? Please share a few in the comments below. 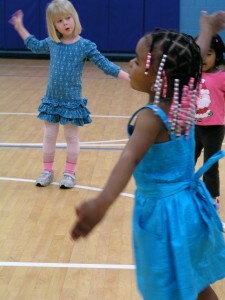 There are FREE Tidbit of Tot-Mama Yoga classes scheduled in December & January, before the next session starts in early 2012 to try out with your 1-3-year old. Space is very limited so register soon! to breath deeply when she was upset, particularly when taking a time out. As we would breath in, she added going up on her toes and then came down on the out breath. Toddler inspired Qi-Gong – it was just great. So sweet Casey. Children really know how to breathe much more fully than we do. It’s more about helping them *not* to forget how I think. I’m watching my nephews over break and today the youngest was in tears over a toy. Hyadi told him to “breathe, breathe.” Thanks for your classes and conversations; we are grateful for your presence in our lives. That’s awesome Maggie! Children don’t forget what they’ve learned. If only we adults were as quick at learning and as thorough at applying the lessons.